James William Hayes, who had reached the advanced age of 99 years, died on Wednesday, March 12, at the home of his son-in-law and daughter, Mr. and Mrs. John Shore, in Los Angeles, Calif. For many years Mr. Hayes was a resident of Versailles and Morgan county. Mr. Hayes was born November 17, 1852. His wife, the former Betty Deering, died about 30 years ago. He is survived by two children, Mrs. John Shore of Los Angeles, and Edward Hayes, a Missouri Pacific engineer, who resides at Lakeside Estates on the Lake of the Ozarks. He also leaves 16 grandchildren, 22 great-grandchildren, and nine great-great-grandchildren. Funeral services were held at the Kidwell funeral home here Wednesday afternoon of this week. Interment was in the Versailles cemetery. –From The Leader-Statesman, Versailles, Missouri, Friday March 21, 1952. Transcribed by Brett Mueller, 01 September, 2007. Although consistently spelled HAYES in the obituary, the family normally spelled its name HAYS. J.W. 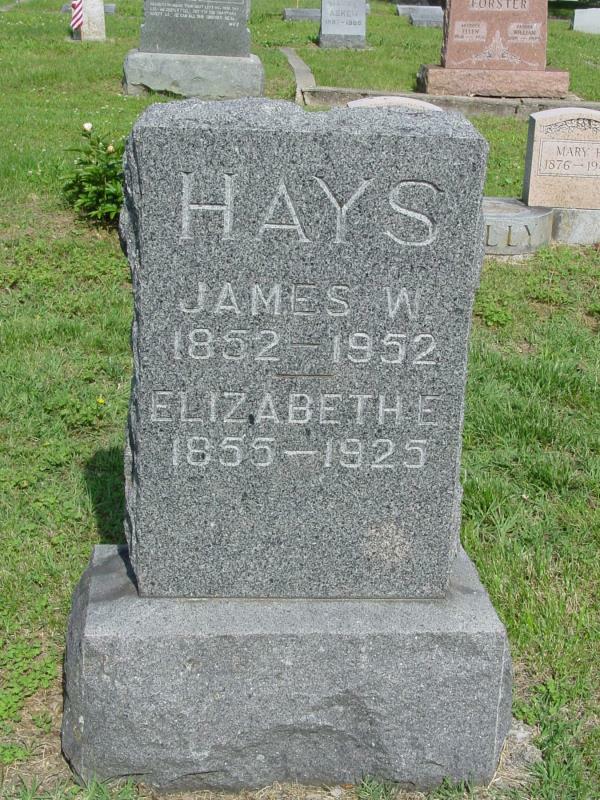 Hays was my g-g-grandfather. His daughter Mrs. John (Sarah) Shore died one month later, on 24 April, 1952.